If you're looking for a Classic Italian Trattoria you'll find it here. We have 3 floors of seating inside plus our Patio out on State Street in the summer. Each area provides a different atmosphere. Everything is made in the delicious Italian tradition. Nearly every imaginable pasta type is available and all are complimented with a wide range of sauces. Begin your meal with fresh homemade bread and finish with a unique selection of desserts. Pizza is also available in a wonderful variety of choices featuring a thin crust. Tutto Pasta offers a wonderful selection of Italian wines as a large part of the Wine List. This restaurant is a classic and the staff is friendly...we are like our own Tutto family! 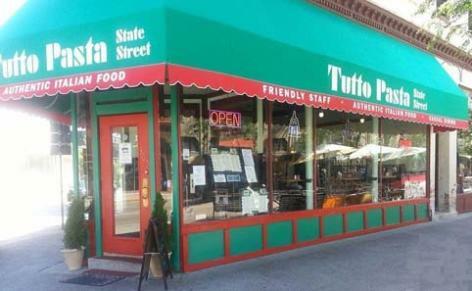 Come enjoy the Unique experience of Tutto Pasta State Street, an Italian Trattoria on Madison's famous State Street.